Friends recently spotted the book at the Museum of Modern Art in New York and MASS MoCA in North Adams, MA. Thanks for sending the photos! Wouldn't Bill Moss Be Pleased? While not at all Bill's design, it was certainly his concept. Designed by award-winning New York architect, Toshiko Mori, Thread is one of the first art centers in Senegal outside of the capital, Dakar. The roof is made of local grass thatch and bamboo and the walls are of locally made mud bricks. The comfortable living area of the Op 200. The Moss Op 200 on an expedition at the South Pole. Two Encores at base camp during a 1984 American Expedition on Gasherbrum IV. We have recently returned from Nepal and I wanted to tell you how much we enjoyed using Moss tents on our expedition to Ama Dablam. While we did not reach the summit, we got very close and your tents played a critical role in our achievement. We left the United States on September 5 and arrived at Ama Dablam base camp (16,500 feet) on September 25. We pitched our two Moss Encores as well as several wall tents used and supplied by our trekking agency staff. Upon reaching the ridge crest where we hoped to find a large snow platform, we found a knife edge instead and resolved that a major excavation of a campsite was necessary. Two days later, we had a 5-by-15-foot ledge chopped out of rock and ice cliff. This became our Camp 1 at 19,300 feet. We eventually set up two Moss Olympics on the ledge and tied them into the slope with fixed line. After climbing another 21 technical pitches consisting of 5.10 rock and Grade IV ice, we reached the shoulder just 1,500 feet below the summit. As with Camp 1, locating a suitable site for Camp 2 was proving difficult and we left all our makings for the second camp (a Star Dome, stoves, food, hardware, etc.) hanging from a piton at our highpoint. It was here that it began to snow. [The storm] lasted three days, the second of which it snowed 6 feet. 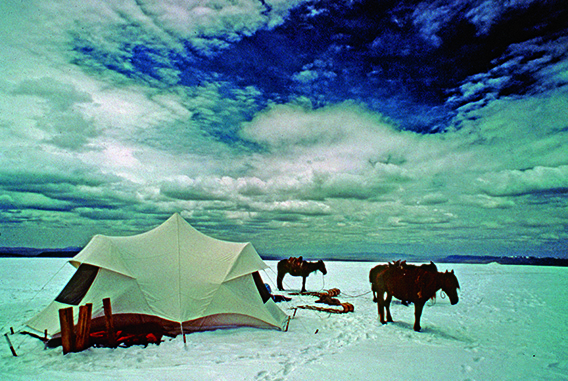 The upper camp had to be abandoned and the storm eventually destroyed all but our Moss base-camp tents, buried equipment, and spelled defeat for our expedition. We were in serious trouble. We sent our two Sherpas to the nearest village in order to recruit porters. We waited for four days before beginning our hike out. The snow had consolidated somewhat but still we were post holing in thigh-deep snow. After five hours and having only gone a mile, I felt we were at the end of our rope. It was than that I saw our Sherpas returning with a large group of porters. It was like seeing the cavalry coming over the ridge. They eventually got to us and helped us carry our equipment to a lower elevation and out of the mountains. 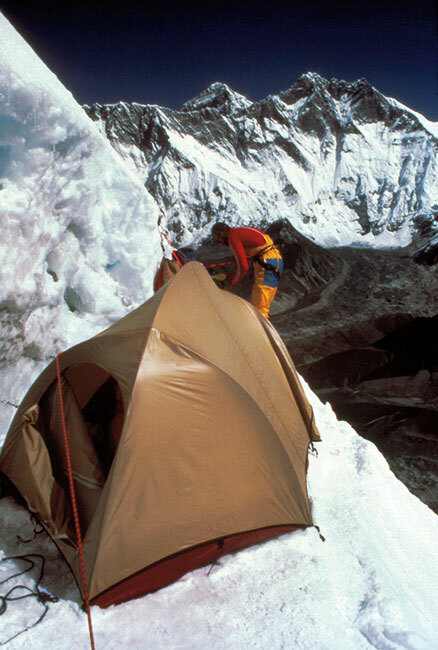 I don't believe we could have accomplished what we did on Ama Dablam without Moss tents. The Encores were suberb base-camp tents; very roomy and bright. The tight confines of Camp1 made the Moss Olympic the perfect tent. We also found that the shape and flexible poles allowed the tent to spill wind. We have nothing but praise for the Olympic. Now through December 24, 2014, Bill Moss: Fabric Artist & Designer is on SALE! I liked Moss tents so much because of the philosophy that blended its design, the great quality fabric and versatile usability. I didn't have an idea howw much effort or energy might be needed to create such a great tent back then. But as I studied more about traditional architecture, the way to design shape from pure nature, and various tent fabrics, I started realizing that all these Moss tents are the result of on great mind on this planet. A custom Moss nylon exhibit with aluminum, shock-loaded tube framework. The 50-foot Fome-Cor Paradome was filled one day in the late 1960s with all the ingredients for a Maine lobster bake. Moss Tent Works, Camden, Maine. Marilyn and Bill Moss stand under the first company sign, "Tent Works," which included an old Singer sewing machine. 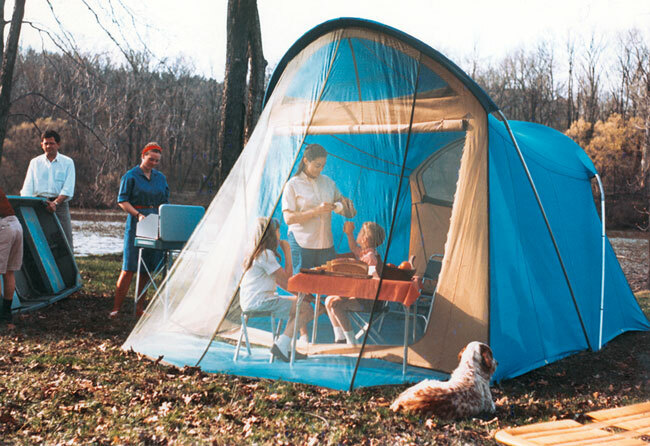 A family tent based on the Eave design and made of blue poplin. 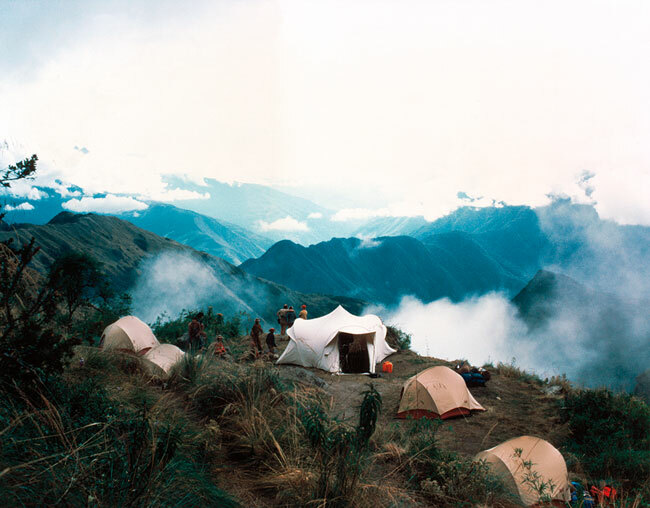 David Blehert and Debbie Koehn camped in a Moss Olympic during their trip to the Cordillera Vilacanota in Southern Peru. "I have been so impressed by Bill Moss products. I know Bill called a top window of his tents the vesica piscis. I know it came from 'flower of life' in sacred geometry. Though I do not know about it well, I love Bill's products influenced by such mysterious things. When I see stars through vesica piscis I always feel an enigma of human life and this universe. No other tents let me think about such things." Volumes I and II of Station Wagon Living by Bill Moss and Frank Reck. 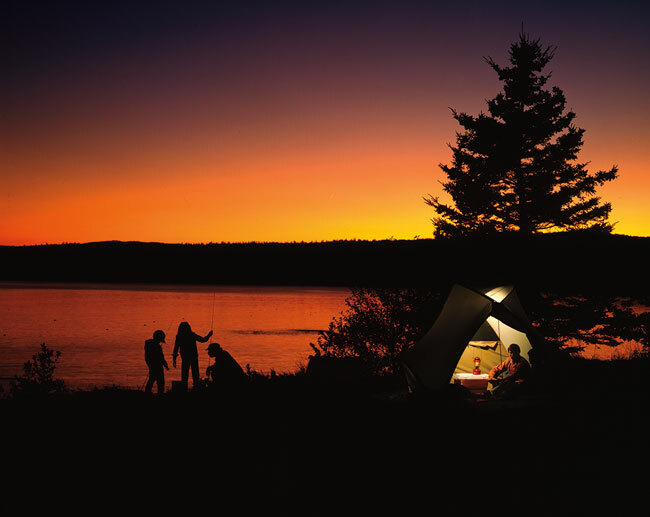 The book was filled with information about family camping, including where to find campgrounds; how to pack the car; what to take on trips; and how to choose equipment for camping, boating, fishing and hunting. Photo by Richard D. Warner, courtesy of Warner Graphics Inc.